Daily Express 7/10/50 front page: "Well, who ordered unicorns anyway ?" 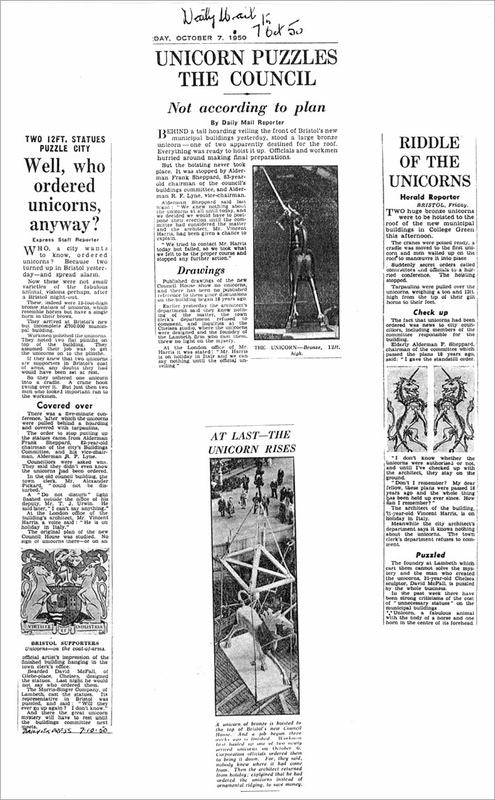 Daily Mail 7/10/50: "12 ft unicorns baffle the city fathers ... 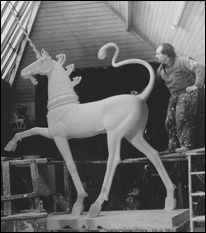 Yesterday ... a 12' high unicorn, one of two, stood ready to be hoisted up... but the hoisting never took place. It was stopped by Alderman Frank Sheppard, 83 year old chairman of the Council's building committee, who said "We knew nothing about the unicorns at all until today, and we decided to postpone their erection until the committee had considered the matter and the architect, Mr Vincent Harris, has been given a chance to explain ... Mr Harris's London office said that he was on holiday in Italy and could not be contacted. 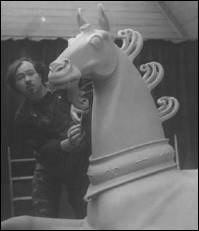 Mr David McFall, Chelsea sculptor who made the unicorns, could not solve the mystery." The Western Daily Press 25/10/50 front page "...£2,400 unicorns ... in the first plan the Unicorns would have stood either side of the main entrance to the Council House; now they will stand on top of the North and South Pavilions ... since the work on the unicorns was stopped, they have been housed separately under the pavilions at the Park St and Cathedral ends of the building. A narrow gauge railway was laid down on which to roll them behind locked doors"
Bristol Evening Post 25/10/50 front page: " ... rising above the wooden fence ... appeared a gleaming, lantern-jawed, wild-eyed, stiff-legged figure. 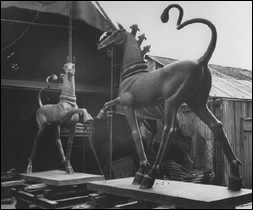 The first of Bristol's £2,400 architectural headaches, the twin Council House unicorns, was on its way up to its pedestal. 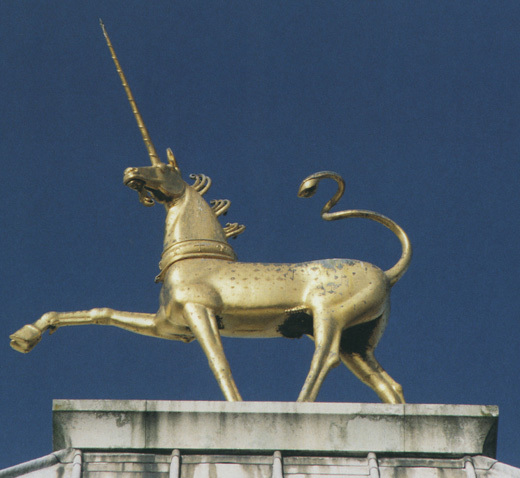 The word to go ahead came late yesterday after Mr Vincent Harris ... had explained to the committee why he had ordered the gilt-painted one-ton unicorns. He had substituted them for a long and expensive length of ornamental ridging that would have cost £600 more". The Daily Express 25/10/50. Daily Telegraph 7/10/50. The Times 11/10/50. Figure Quarterly Vol 24 Spring 1959 page 54. The Times 16/4/56 "...New Council House ... will be opened by the Queen tomorrow"; News Chronicle 7/4/56 "Civic Treasures of Bristol" by M.E. Williams. The Unicorn is a fabled creature symbolic of virginity and usually represented as a horse with a single straight spiraled horn projecting from its forehead. In heraldry a representation of this beast, having a horse's body, a stag's legs, a lion's tail, and a straight spiraled horn growing from its forehead is employed as a supporter for the Royal Arms of Great Britain or of Scotland. It is a grade II listed building. The concrete frame is clad with very wide, thin bricks, with Portland stone dressings and a leaded hipped roof in a Neo-Georgian style. The steep and high roof with gilded unicorns to the corners of the end blocks. The foundation stone for The Council House was laid in 1938 and the building was opened by the Queen on 17/4/1956. The ceremonial entrance overlooks the moat and leads into the reception hall which is lined with local Doulting stone and paved with black and white Italian marble. It also features a blue and gold wall clock, encircled by the signs of the zodiac and equipped with its own wind indicator. The Conference Hall is the largest room in the building. The names of all Mayors and Lord Mayors of Bristol since 1216 are cut into the stone walls. The walls of the Lord Mayor’s Reception Room are panelled in English Walnut and there is a colourful frieze displaying the heraldry of the Bristol trade guilds, and, in gold leaf, the names of famous Bristolians. Reference: The Council House 1935-1952. “An important work by the most celebrated civic architect of the first half of the C20.” (The Buildings of England: Pevsner N: North Somerset and Bristol: London: 1958-: 413). 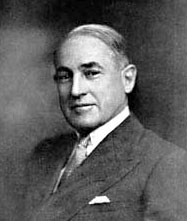 E. Vincent Harris (June 26, 1876 - August 1, 1971). 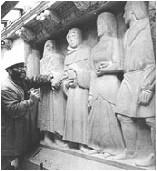 Emanuel Vincent Harris OBE was an English architect who was most notably responsible for the design of several important public buildings. He was primarily classicist; A. Stuart Gray wrote "Some of his buildings suggest the influence of Sir Edwin Lutyens, but are bolder, balder, and less subtle or more frank depending on one’s point of view". His work was often criticised by Modernist architects. In his acceptance speech when he was awarded the RIBA Royal Gold Medal in 1951 Harris is reported to have said "Look, a lot of you here tonight don't like what I do and I don't like what a lot of you do...". 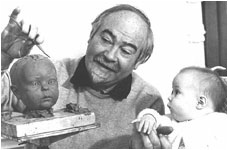 He became a Member of the Royal Academy in 1942.